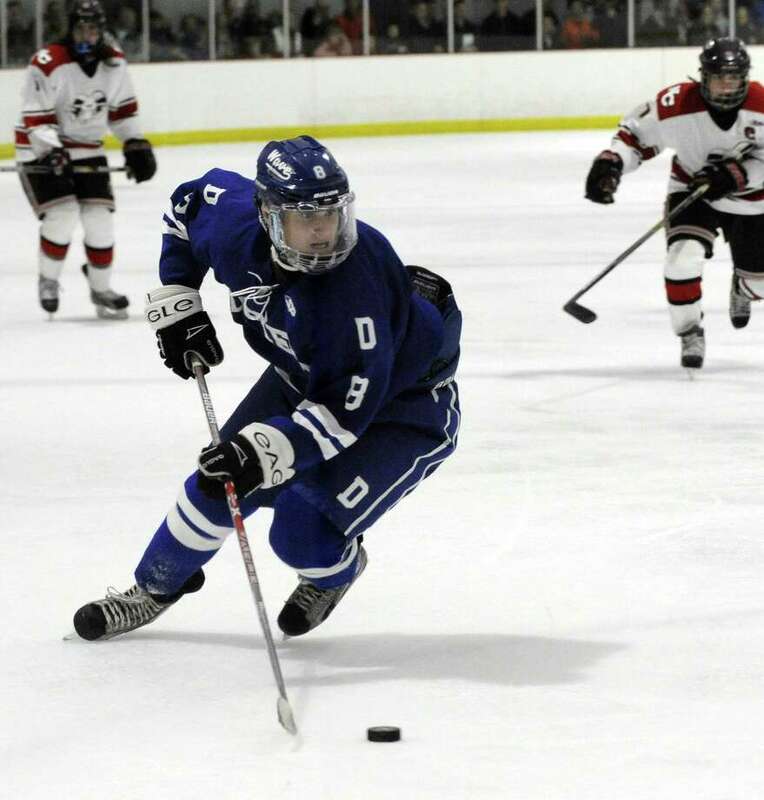 Darien’s Arden Cohen takes the puck in a FCIAC boys varsity ice hockey game against New Canaan at the Darien Ice Rink on Dec. 27, 2016. New Canaan defeated Darien 5-2. Senior forward led the Tigers to the CIAC Division I and FCIAC championships, scoring 21 goals and adding 11 assists … CHSCA Player of the Year, All-State Division I first team, All-FCIAC first team. Senior forward helped lead the Blue Wave to the CIAC Division I first round … All-State Division I second team, All-FCIAC Division I second team. Junior forward led the Cardinals to the FCIAC semifinals and CIAC Division I first round … All-State Division I second team, All-FCIAC Division I second team. Senior finished career with 47 goals and 33 assists for total of 80 points … Four-year player for the Indians … All-State Division II first team, All-SCC Division II second team. Senior forward scored 22 goals and had 16 assists for a total of 38 points during senior season for the Rams, who were runner-up in the FCIAC and reached the CIAC Division I semifinals … Finished four-year career with 53 goals and 38 assists … All-State Division I second team, All-FCIAC first team. Senior defenseman contributed three goals and 12 assists to help lead the Rams to the FCIAC title game and CIAC Division I semifinals … Had nine goals and 29 assists over four-year career … All-State Division I first team, All-FCIAC first team. Junior defenseman played in 22 games with four goals, six assists and a plus-26 to help lead his team to the CIAC Division II and SCC/SWC Division II semifinals … All-State Division II first team, All-SWC first team, All-SCC Division II first team. Senior goalie had a 1.59 goals-against average and finished season with four shutouts in 20 games to help his team reach the CIAC Division II and SCC/SWC Division II semifinals … Played 907 minutes, registering 466 saves … CHSCA Division II Player of the Year, All-State Division II first team, SCC Division II Player of the Year, All-SWC first team, All-SCC Division II first team. Senior defenseman and four-year starter helped lead the team to the CIAC Division III tournament for the second straight year … All-State Division III first team, Hobey Baker Award recipient, All-FCIAC Division III second team. Senior defenseman finished season with 16 points (six goals, 10 assists) for the CIAC Division I and FCIAC champion Tigers … All-State Divison I first team, All-FCIAC first team. Senior goalie posted a 1.478 goals against average, a .950 save percentage and a 21-2 record for the Tigers, who won the CIAC Division I and FCIAC championships … Allowed 34 goals on 695 shots … All-State Division I first team, All-FCIAC first team. Junior goalie led the Cadets to the FCIAC quarterfinals and CIAC Division I first round … All-State Division I first team, All-FCIAC Division I second team. Senior defenseman helped the Eagles reach the CIAC Division II first round … Hobey Baker Award recipient, All-State Division II first team, All-FCIAC Division II second team. Senior forward helped his team reach the FCIAC semifinals and CIAC Division II first round … All-State Division II first team, All-FCIAC first team. Senior goalie led his team to the FCIAC semifinals and CIAC Division II first round … All-State Division II second team, All-FCIAC first team. Coached the Tigers to the CIAC Division I and FCIAC championships and a 24-2 record … FCIAC Coach of the Year.